Military Trophies and a figure of Fame with two trumpets. All of these prints are stylistically very different from the corresponding prints on Worcester porcelain commemorating the King of Prussia. This mug was in the Norman Stretton Collection and was exhibited in the first NCS Exhibition at Temple Newsam, 1974, catalogue no. 110. 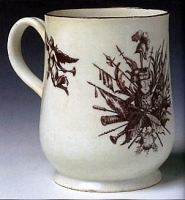 The likely source of the King of Prussia print on this Bow mug is this engraving by R Houston after the painting by Pesne and printed for John Bowles. The reverse of the mug with prints of Fame and Military Trophies. This Bow bell-shaped porcelain mug bears a print of Frederick the Great, King of Prussia, in a brownish purple entitled "the PRUSSIAN HERO", flanked by a putto bearing a flag and a laurel wreath. The reverse is printed with an elaborate assembly of Military Trophies and a figure of Fame with two trumpets. All of these prints are stylistically very different from the corresponding prints on Worcester porcelain commemorating the King of Prussia.